Hidden in Coronado Springs Resort’s El Centro, between the lobby and the Casitas section of the resort, Maya Grill offers a Latin American menu in the midst of Mayan architecture. 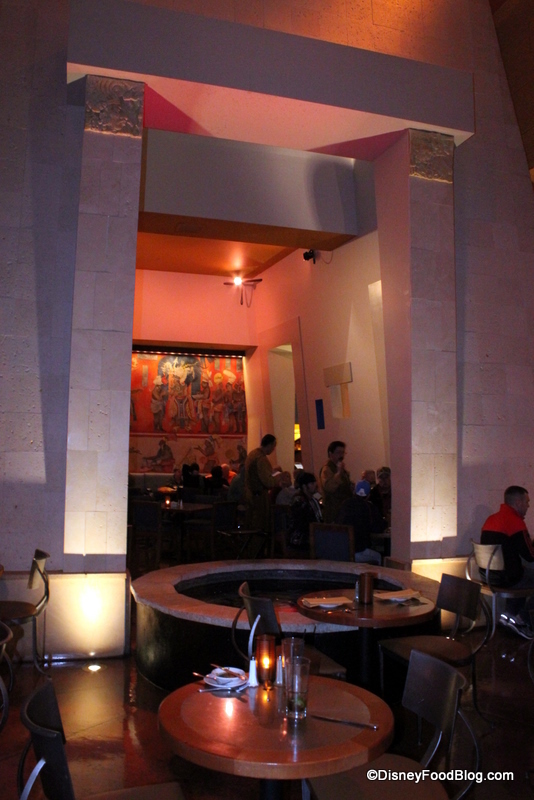 You really do feel like you’re at the entrance to a Mayan pyramid when dining in this restaurant, and the decor — with soaring ceilings and moody lighting — is stunning. 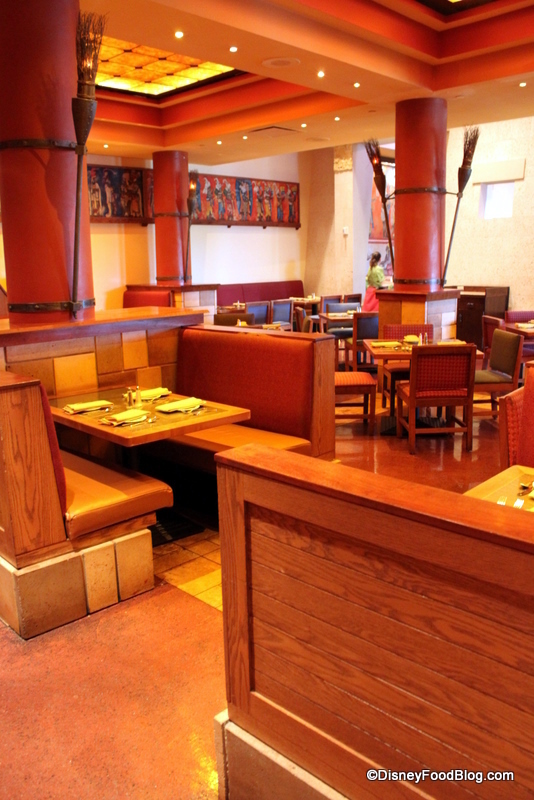 But many folks shy away from Maya Grill due to its distance from…well…just about everything. We arrived without a reservation, and although I could see many empty tables, we were told there would be a 45-minute wait. 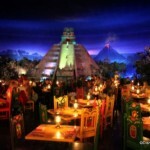 This was disturbing, since I think of Maya Grill to be one of the lesser-populated restaurants in Disney World. 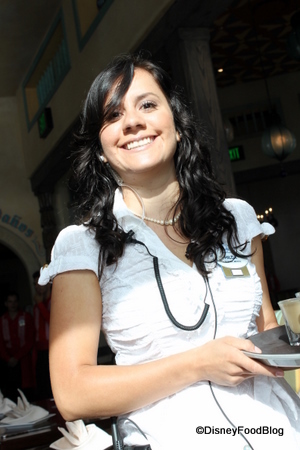 But since we were already staying at Coronado Springs (and since we had to eat here anyway so that we could cover it on the blog), we just told the hostess that we’d come back in 45 minutes, and spent the time catching up on work in our room. When we returned, she’d forgotten who we were, but at least we were seated within about 10 minutes. 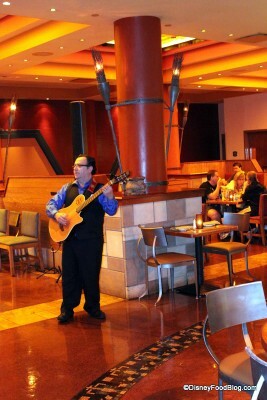 When we were there, live entertainment was being offered (a la the gentleman below). That’s always a nice touch, and it made the evening very pleasant. 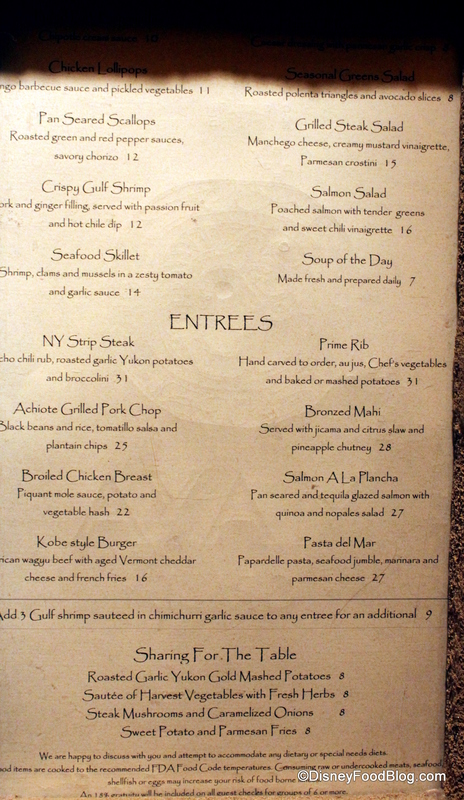 The menu is…a mix. 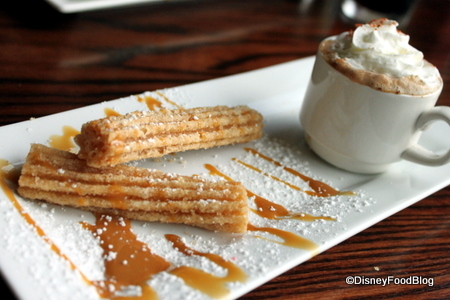 While the restaurant is definitely striving for a Latin American feel (it’s owned and run by the same folks who run the restaurants in Epcot’s Mexico Pavilion), the menu is more varied. You do have items like tomatillo salsa, mole sauce, black beans and rice, and tequila glazed salmon. But you also have things like a burger with cheddar cheese and fries, and Prime Rib with mashed potatoes. By the way, on our visit, we had the menu below, but the starters were more similar to those on this current menu. We must have been there in transition… . 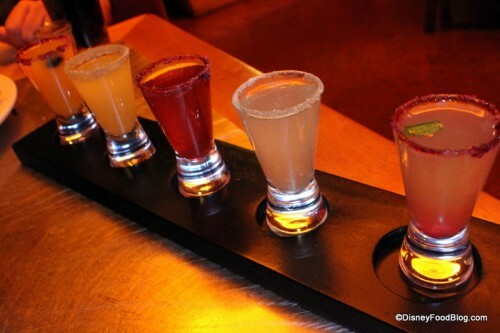 You’ve heard me blabber on about this margarita flight before. 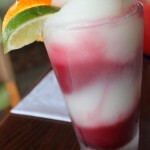 It featured Lime, Pineapple, Hibiscus, Jalapeno, and Mango Blueberry flavored margaritas, all of which were lovely. As you know, my favorites were the ones that didn’t include any flowers or vegetables. 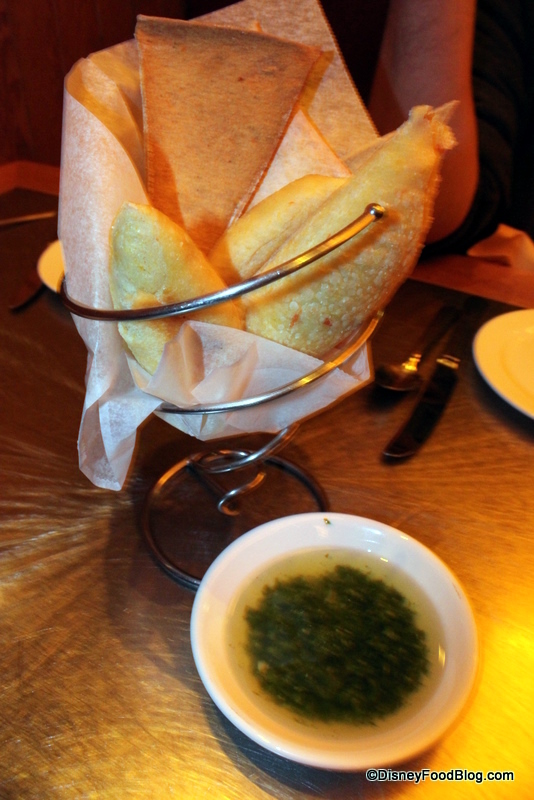 The actual food portion of the meal started with a very nice bread basket, coupled with olive oil (?) 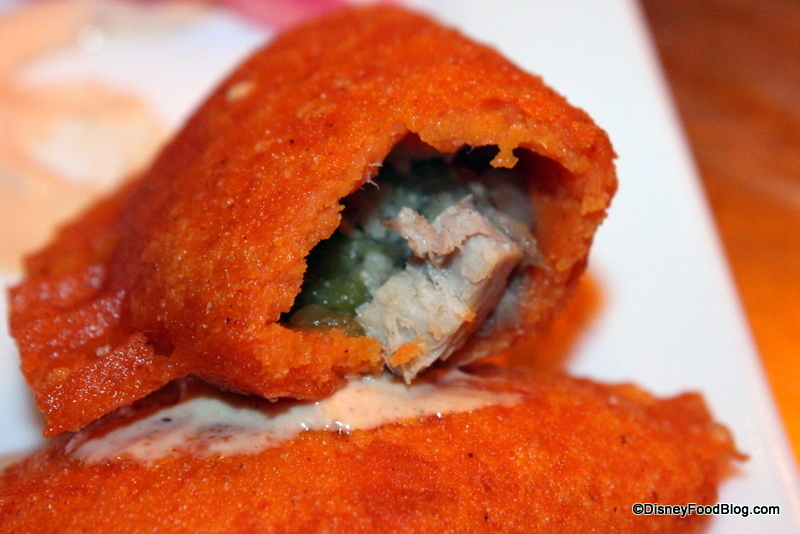 and a Pulled Pork Empanada with Chipotle Cream ($9). We also ordered the Heart Of Romaine Caesar ($8). The empanada was delicious — both of us probably ranked this starter as one of the best parts of the meal. 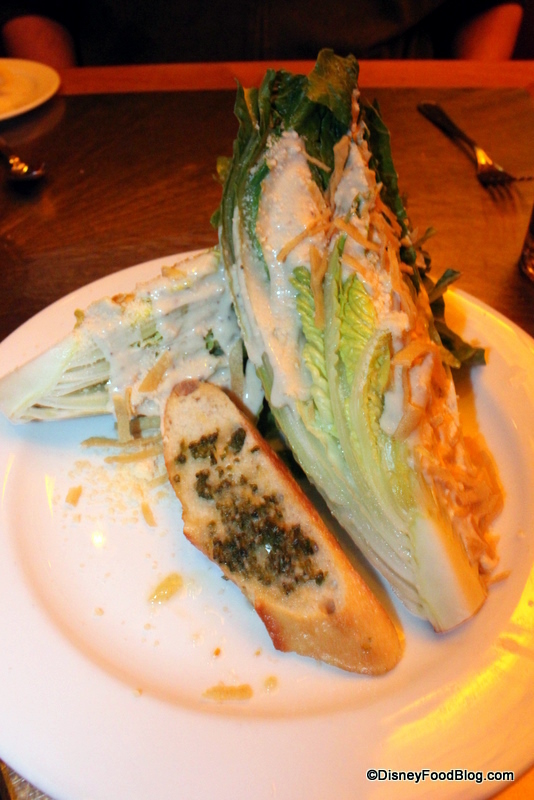 The Caesar was yummy, and we loved that it came with bread! For entrees, we ordered the Achiote Pork Chop with black beans and rice and tomatillo salsa ($25), and the New York Strip Steak with ancho chili rub, roasted garlic Yukon Gold mashed potatoes, and broccolini ($31). The pork chop was, unfortunately, severely overdone. 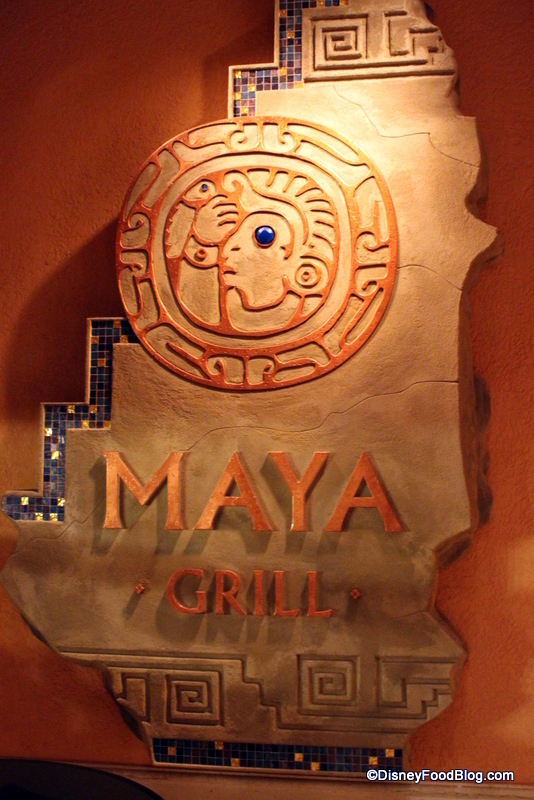 Sadly, this is often the case in restaurants, and Maya Grill was not an exception. While it looked pretty, the meat was tough and chewy. Not a great entree, and especially not for the price. The steak was much better, so we ended up sharing that as the bulk of the meal. 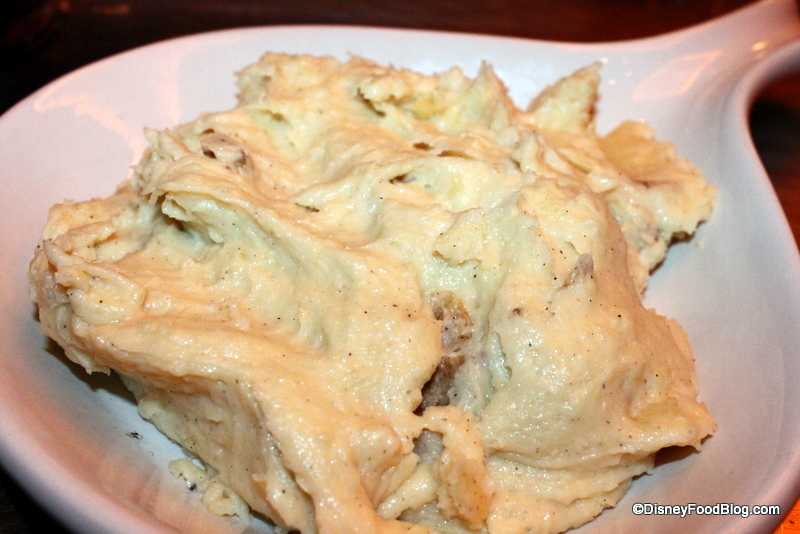 We also ordered an extra side dish of the mashed potatoes, which were delicious. We didn’t order dessert (I know…shocking! 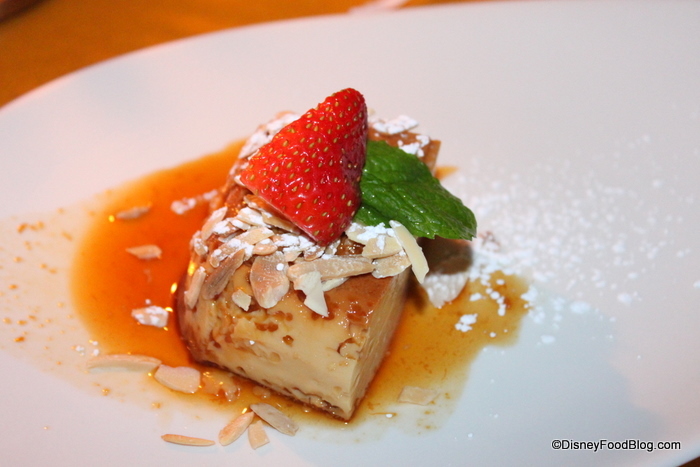 ), since the desserts at the Disney World Mexican and Latin American restaurants are often overpriced and under-portioned (we learned our lesson with the San Angel Inn flan and the La Hacienda de San Angel Churro(s)). We did take a look at what was available, though, and snapped some pics of the “display” desserts for you! Coronado Springs is one of my favorite Disney moderate resorts. It’s gorgeous, the rooms are newly renovated (looking snazzier than a few of the deluxe resorts, if I do say so myself), and there’s a gym — something that I consider absolutely necessary seeing as I usually spend my vacations eating five meals per day. But because it’s in the Animal Kingdom resort area, to get here you’ll either have to drive yourself, take a cab, or take a bus from a major hub like a theme park or Downtown Disney. Unlike many other resort restaurants, this one isn’t just a boat ride or short walk away from wherever you spent your day — and there aren’t lots of other activities at this resort to make it worth your while. And, I’ll be completely honest — the food isn’t quite at the level desired to make all of that traveling worth it if you’re not already staying at the resort. 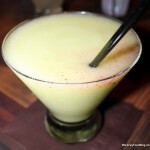 Once again, I love the margaritas. I love the margarita flight. But, from my experience, the food isn’t quite there yet. That said, I’ve heard that the breakfast here is great!! Does anyone have any reviews? 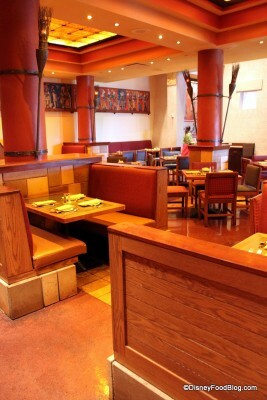 I’d love to hear your feedback on Maya Grill! Your comments will help other readers decide whether or not they want to visit, so be sure to let us know what you think in the comments section below! I had a similar experience with the wait during my 2007 visit. My family stayed on-site and we had an ADR but apparently so did 2 conventions and they only had 1 group booked so we were in limbo. 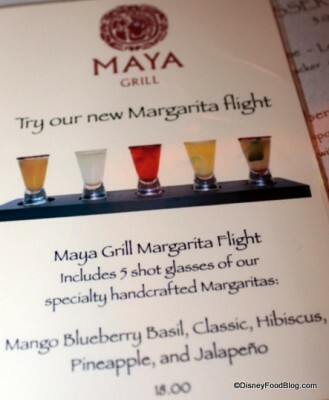 I’m insanely jealous of that margarita flight. I ate at Maya Grill during our honeymoon and that was enough. I wasn’t impressed by the theme and even less impressed with the food. 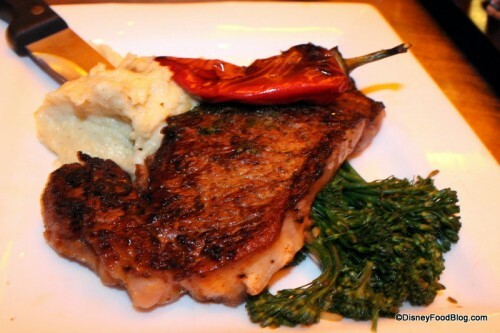 NY strip steak? prime rib? C’mon! Enough of the watered down food. 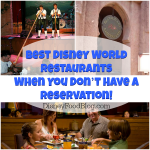 Give me a reason to come to your restaurant over the other dozens of choices at WDW! 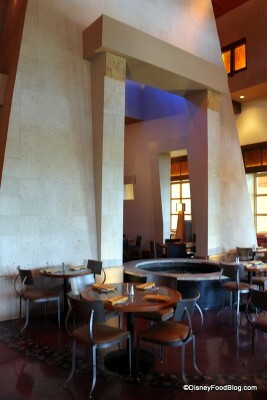 We ate at Maya Nov 2010 and it became a must do for us. 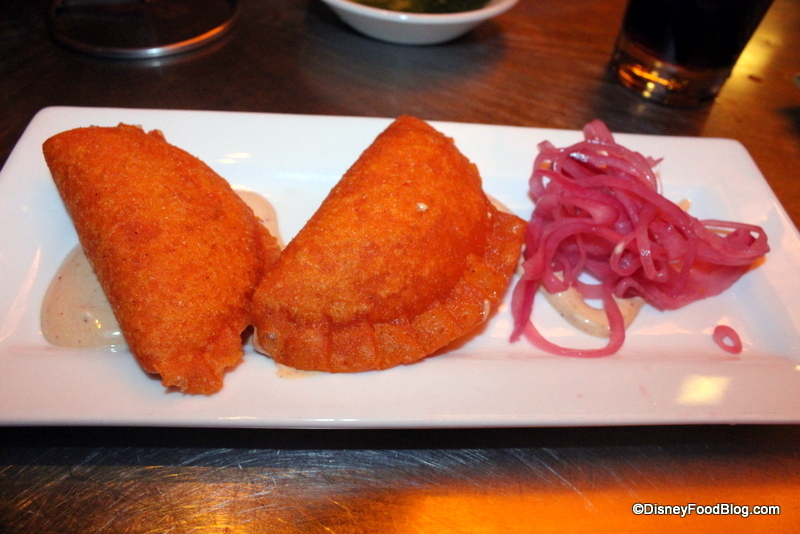 It was a great meal, the empanadas were yummy! I know one of us had the strip steak and it was very good. We enjoyed the meal start to finish and had wonderful service. 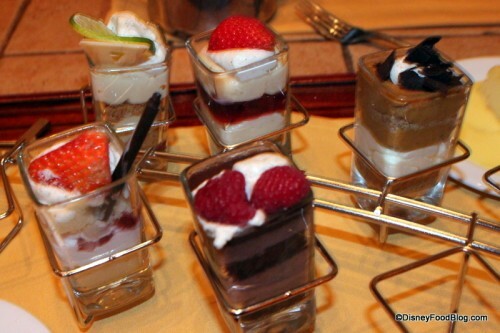 We liked the small size of the desserts, just enought to satisfy your sweet tooth! I have been staying at this resort.. since it first opened.. and I just love it. 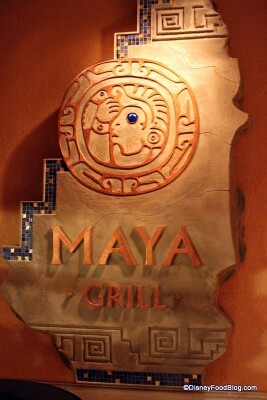 I have never eaten at the Maya Grill.. because when I was younger I was picky.. so I didn’t care for the menu. And, now that I am older.. I am less interested since they departed from their Latin American flair and introduced a boring menu. And, yes I agree.. that is the only down fall of the resort. You’re not really near anything so there is no “short-walk” to a park. But something about the resort.. maybe it’s the beauty of the grounds.. or just how I feel like I am the most relaxed person in the world.. makes me come back every year for more! I wish I could have tried the CS place next to it (can’t remember the name) — I hear it’s better. 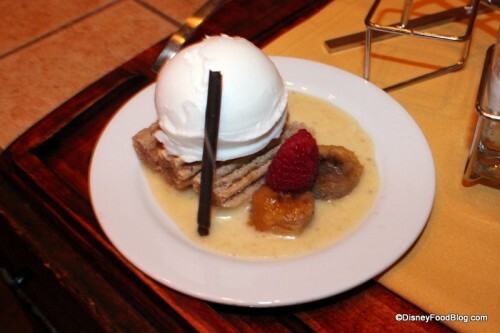 Like so many reviews lately we see a beautiful restaurant with so-so food. 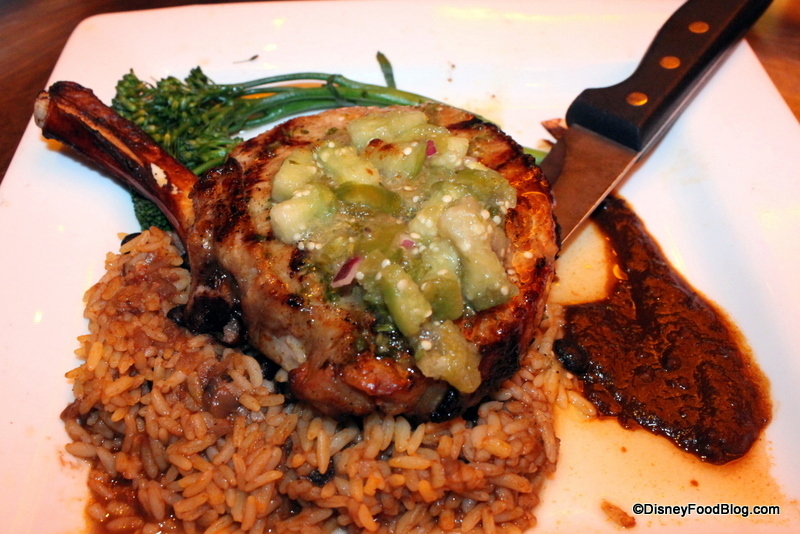 Some of the dishes are great but then you get an overdone pork chop which is just a big mistake. Basic miscues like that should never leave a professional kitchen. You could excuse it due to the amount of food most Disney restaurants must turn out each day but it appears that AJ ate there at a less than busy time. Maybe there is a systemic problem that the Disney execs need to sort out. 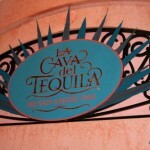 Even though the Maya is in a moderately priced resort there really needs to be more oversight on quality. I have stayed at Coronado Springs a couple of times. It’s a very large resort, but well themed. 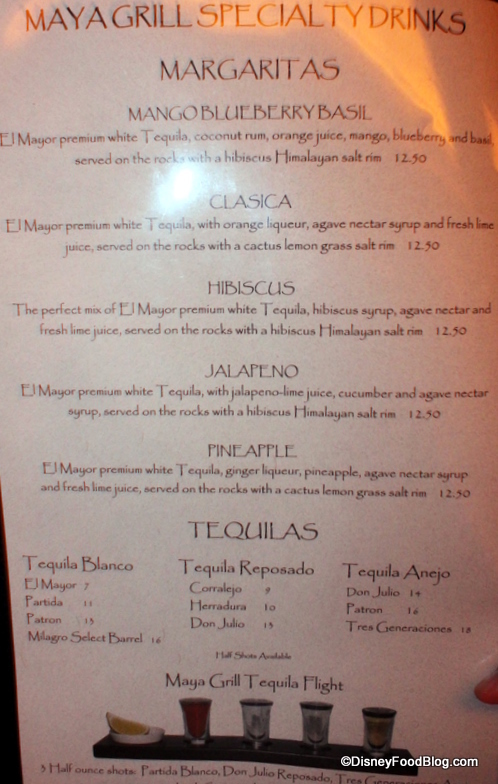 While my dinner at The Maya Grill was ok, ok dosen’t justify the price. Breakfast is another story. I have never had a bad breakfast here. Our favorite sever, Jesse, takes very good care of us. 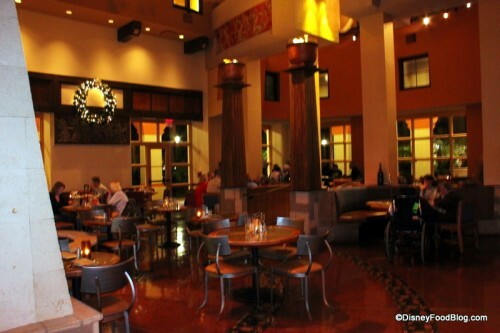 If you are a guest at Coronado Springs, the Pepper Market may be a better pick for dinner. I ate there a few years ago. The place was jam-packed at about 9pm after a 1-hour wait. Clearly a resort the size of Coronado needs another dining option. I had an appetizer that I will basically call gross. It was a sort of shrimp cocktail with lime pulp all over it. There were no spices used – just steamed shrimp with lime pulp. There was a filet mignon on the menu and it was terrific. The decor was blah. The service was not good. Don’t make a trip for this place. But I have to echo the comments that Coronado is a great resort. Lots of activities, nice rooms, more adult oriented, and hammocks on the beach! 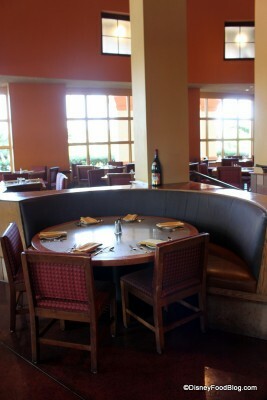 even though there are empty tables, there is still possible for there to be a wait at a restaurant. they may have been short staffed that night. would you rather be waited on a busy server with 10 tables who basically ignores you, or wait a little for good service when someone can take you as their fourth or fifth table? empty tables does not always mean you will be seated immediately. My husband and I ate at the Maya last Monday night and had the 2 person platter. The food was outstanding! 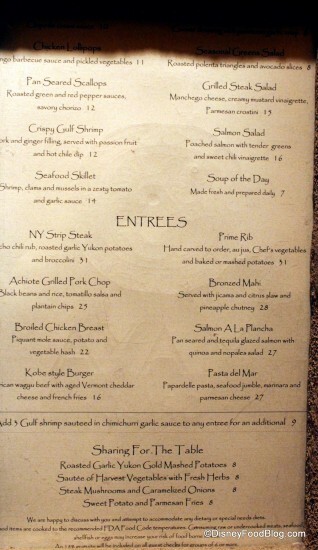 Perhaps a bit pricier than you’d expect ($50 per plate). The white chilean wine (sav. blanc) was good too! But the best part was the guitar player – Marcelo Puebla is his name. He is AMAZING. If you like spanish guitar and atmosphere this is the place to go. It’s worth the spend. Our server (Abdel) was perhaps the best server I’ve had in the Orlando area ever. If you go, go on Monday – Thursday night… sit where you can enjoy the music… ask for Abdel as your server. You won’t reget it! we ate here twice last year, once for dinner and once for breakfast. the breakfast was very good. dinner not so much. honestly dinner was the second worst meal i ever had at disney ever . if you eat here i highly recommend breakfast. 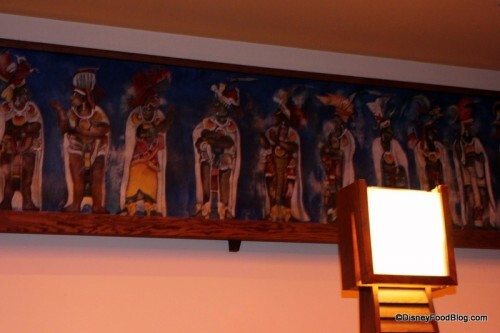 We stayed at Coronado Springs in 2008, and ate at Maya Grill. We enjoyed our meal, so when we were booking reservations for our recent Disney trip (last week), we made sure to come here for dinner. After the experience we had, I came back to this blog to see if you experienced something similar and felt compelled to write a review. We had a 6:20 reservation, and we weren’t seated for at least 30 minutes. The table we were seated at never had anyone there before us and there were several other empty tables. We asked for a high chair for my 2 year old when we checked in, and had to ask again when we were seated. Our server was as great as she could be, but the food and drinks came out really slowly which was annoying, especially since the restaurant wasn’t that busy. 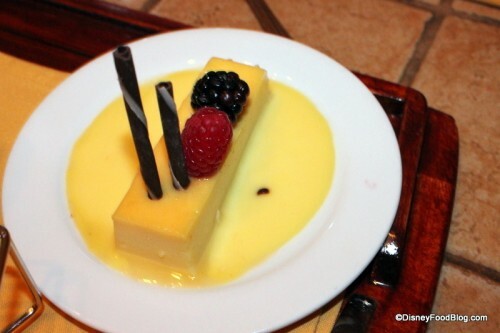 We were staying at the Contemporary, so to go to Magic Kingdom and then take a bus to Coronado Springs was a long trip within the property and so not worth it for the food and service we had. The food wasn’t bad at all, but not worth the trek out there. My Sister-In-Law spoke to a manager about how long it took them to seat us even with a reservation, and all he really did was say sorry. Disney typically has excellent service, so I was disappointed that this manager did nothing to make it up to us, nor did he seem sincere in his apology, even when we told him we would probably miss the Magic Kingdom Electrical Parade (even though we made a reservation early enough to ensure that we’d be back on time). If you’re staying at the resort, I’d give the place a try just because it’s there and the food isn’t awful, but I would never travel far again to eat here.